Although the moon won’t be full until tomorrow (Friday, February 18) at 8:36 Universal Time, it falls in the wee hours after midnight for much of North America. As seen from our part of the world, the moon will probably appear as full tonight as it will tomorrow night. 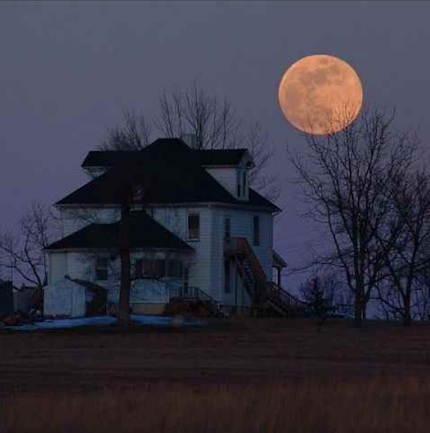 The image – a February moon from years past – was taken by Dan Bush. His Missouri Skies Moon Page is not to be missed. This February full moon goes by many different names. The February full moon was called the Snow-blinding Moon by the Micmac people in eastern Canada. It was the Wind Moon to the San Ildefonso of the southwest. And it was the Blackbear Moon to the Kutenai of the northwest. Today, we call the February full moon the Snow Moon or Hunger Moon. Every full moon stands opposite – or nearly opposite – the sun. Try noticing how high above the horizon you see the moon tonight. Its distance above the horizon indicates approximately how far below the opposite horizon the sun is at that time. Any time you see the moon near the horizon, it can have a reddish color. The reason is Earth’s own atmosphere. The moon’s (or sun’s) light must pass through a greater thickness of atmosphere when rising or setting (that is, when it is near the horizon) than when overhead. Since the atmosphere scatters the bluish component of light, while allowing the redder light to travel straight through to our eyes, objects often appear redder than normal when near the horizon. So any moon, full or not, may look reddish when seen near the horizon. When can you see earthshine on a crescent moon? Regulus, the brightest star in the constellation Leo, shines close to the moon tonight. Watch as the February full moon and Regulus parade across the sky together from dusk till dawn! Previous Story: Learn from these young Egyptians? Site contents copyright © 2019 Recorder Online	except as noted. All rights reserved. | 83 queries in 1.348 seconds.